Welcome to ARTECO! Our recycled jewelry is made from high tech materials -- computers, electronics, industrial, aerospace and military. 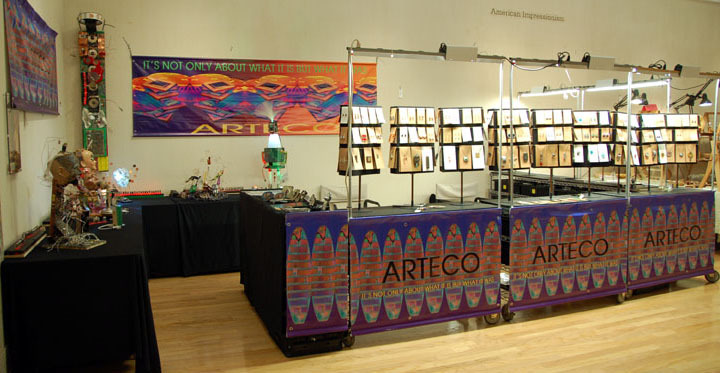 It is the eclectic fusion of art and technology. Technomontages include sculptures, jewelry, lamps, bowls and commissioned works. All items are hand made by the artists. We are eco conscious and use repurposed materials -- our works are artfully recycled for the eco minded. Some items are forged and fused into a new age folk art. Soon our interactive art will include installations that show electronics from its beginning with tubes to its future with nano devices. See our jewelry in the eco Go Green edition of the 2008-2009, 2009-2010 and the 2010-2011 Philadelphia Eagles Cheerleaders calendar. Visit Eco-Chick, a forward thinking eco minded website, where you can read an article about our jewelry. Read our interview on WFMJ, 21 News Now, Youngstown, OH. Our jewelry is now available at Carnegie Mellon University. Look for the showcase on the first floor of their bookstore.